The Hardwater Jacket is for anglers that love the ice, but wear a jacket only when necessary. You may not use your jacket often, but when you do, it’s a lifesaver, literally. 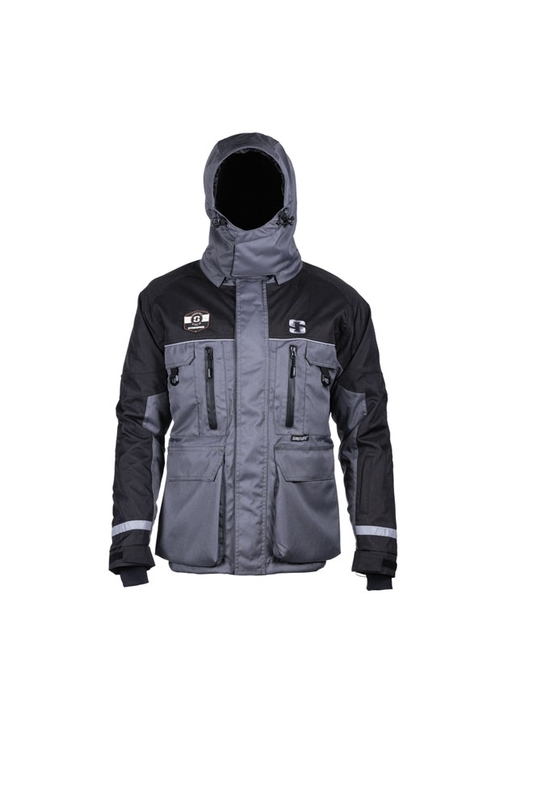 Loaded with SUREFLOTE™ and surrounded with 360 degree reflective material, the Hardwater rides with you on the way out, and keeps you safe and warm for the journey back. Like a hood but not how it cramps your style? Mold the Hardwater hood to your spec with wireframe outer, or remove the hood altogether when you don’t need it. Love it to keep warm early morning, but loathe it after the sun comes up? Simply unzip the underarm vents and fish-on. Striking features and Striker innovations make this our most equipped jacket. The Black/Gray style is available in sizes 5XL and tall sizes (add $30). Sizing Note: Please refer to the size chart for sizing instructions. Generally, this item runs about a half size larger than normal sizing. The tall sizes add about 3 inches to arms and length. Staff Note: This all time favorite had its beginnings with the original 2012 "Heavy" ice suit. It has evolved into one of our most tech-featured jackets, with the ruggedness of a 600D Endura shell. This is the style of choice for slower movers, "mature" ice fishermen, and bucket sitters. The HardWater is also a bit fuller cut in the mid section.